Visitors often wonder if there are supermarkets, vegetable produce vendors or convenience stores in San Pedro. The answer is a resounding YES!!! There are in excess of 15 markets on Bonita Island, almost all within the commercial district in San Pedro Town. 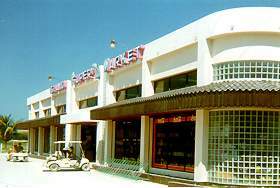 The top grocery market is the Island SuperMarket just south of the San Pedro Airport by the Bowen Bottling plant - featuring full services and the most comprehensive line of groceries and personal hygiene items on the island. Other grocery markets are San Pedro Supermarket at the north end of town, Rock’s on Pescador (Middle) Street in town, and many, many smaller markets scattered around town. The larger supermarkets have considerably more than the inventory of a large convenience store in the U.S., plus items such as frozen meats and liquor. Prices for most food items, especially imported items, are somewhat higher than in the U.S. There is an juice market in the north part of town, by the San Pedro Supermarket, that has the best fresh orange juice on the planet. I dream of it. Its $5US a gallon, and buy 3 the first time to save yourself trips. I swear, I have been a chef for over 20 years, and they have the absolute best that ever touched my lips. In addition a full range of food and junk food stores is also to be had along with clean, reverse osmosis filtered water and inexpensive water bottle refill stores. In addition, several dozen specialty food vendors walk and ride three wheel bicycles about, peddling their specialty food items which range from ice cream and tortillas to conch and shrimp ceviche to hamburgers. Ambergris Caye north of the Boca del Rio ferry have no grocery stores or markets, however. Residents, or tourists commute via resort water taxi to San Pedro Town or walk or ride in to town to do their shopping if the local resort doesn’t have what they need. There is wide range of locally-produced vegetables, fruits and marine products. Rice, corn, red-kidney beans and basic meats are the staple, locally- produced diet. Manufactured goods, including food products, are almost exclusively imported and retailed through supermarkets and small shops. Posted : Marty Casado - Thu, Dec 7, 2006 12:01 AM. This article has been viewed 14412 times. It is expensive but remember, you are on an Island..